"From the land of pleasant living..."
I'm rather envious of how productive some of my fellow bloggers have been recently. For me, traditional holiday activity, combined with ongoing family needs, has pretty much negated any opportunity to really dig into meaningful work in the basement. 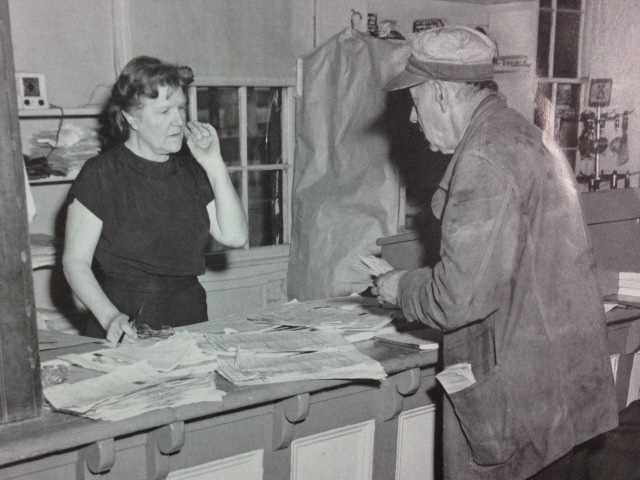 But I did steal some time recently on the computer to do some additional research on Baltimore and surrounding areas in 1960. I was most interested in confirming popular local brands from that time for use as layout signage and for ambience in the lounge area. Significant identifiers such as beers, soft drinks, restaurants, TV/radio and professional teams seemed like good places to start. 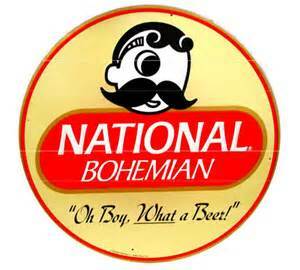 'Natty Bo' is the local beer of choice, then and now. The iconic mustachioed character immediately identifies the brand. I think that this could make a great billboard. 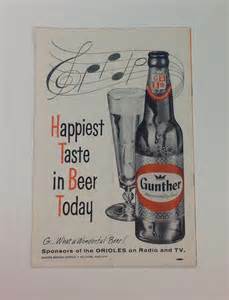 Another version of the beer's advertising features a different tag line, but one I think is so evocative of an earlier, simpler time. Alas, I must identify which slogan was used in 1960. I am really hoping that it is this wonderfully innocent one, "from the land of pleasant living." 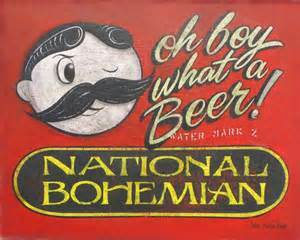 If National Bohemian, sponsors of the football Colts, could be, "Oh boy, what a beer!" 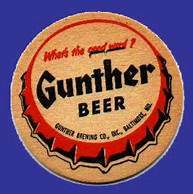 then competitor Gunther might as well be, "G, what a wonderful beer!" 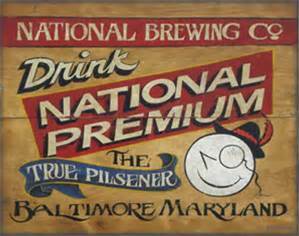 They sponsored the baseball Orioles, but do not seem to have been much of a factor in the beer market. 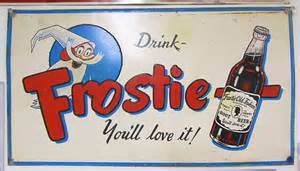 Frostie root beer was a very popular regional drink in 1960. I suspect that a little bit of Photoshop work could make this a really neat metal sign adhered to the side of a general store or feed distributor for instance. 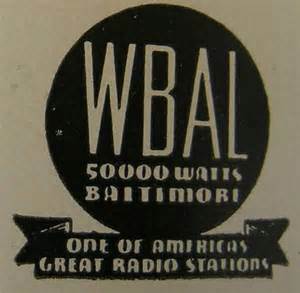 The only one real radio station in Baltimore back in the day was WBAL-AM who broadcast the Colts, Orioles and all of the day's popular hit songs. 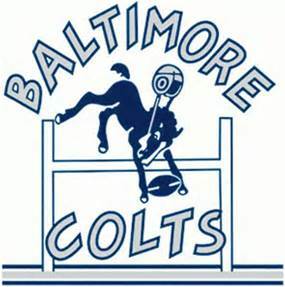 I have countless images for the Baltimore Colts who entered 1960 as the defending NFL Champions. 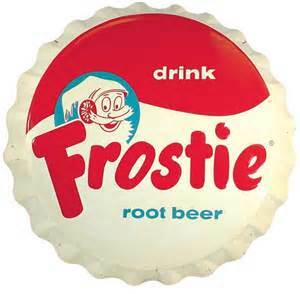 This earlier logo, predating the iconic horseshoe, is thoroughly unsophisticated and too busy to be marketable today. It is not slick whatsoever, therefore perfect for its time. 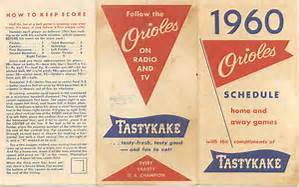 Like the Colts, I have countless images for the Orioles, but am unsure I actually have anything to use, outside of pennants or banners that could find their way into a scene on the layout. But research did confirm a local pastry from that time and I'll follow-up on Tastykake to see what I may find. 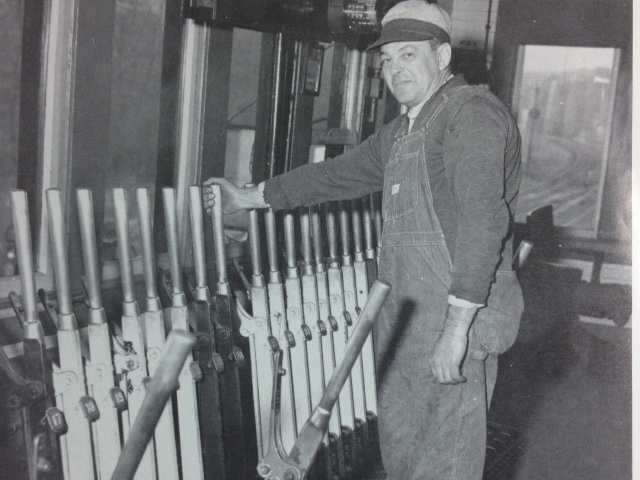 Several Colts' players capitalized on their fame with local business ventures in the late 1950s/early 1960s. 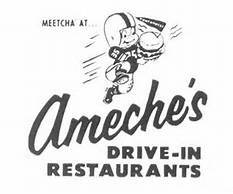 Fullback Alan Ameche of overtime touchdown fame had a number of drive-in family restaurants, while his teammate, defensive end Gino Marchetti, had Gino's, a fast food burger place. 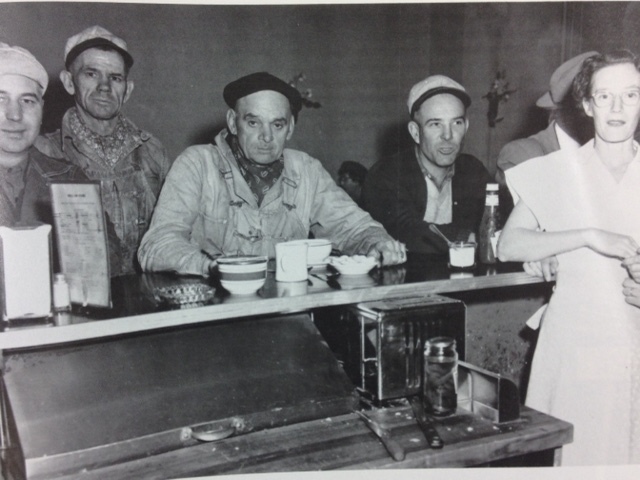 Each took advantage of the early days of the McDonaldization of America. I enjoy research because you never know what you may uncover. One other interesting tidbit comes from the Carling Brewery, which handled Natty Bo for awhile. 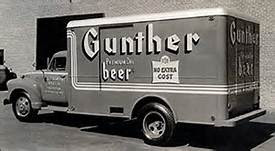 They introduced a malt liquor product around this time, long before political correctness was even a concept. Although it was called Colt 45 and used a pistol as its logo, it allegedly was named after Colts running back Jerry Hill who wore number 45. I can't verify that, or simply attribute that to folklore. Either way, it's part of the fun of research. Having said that, I am really chomping at the bit, as they say, to get back to building and modeling. One can hope. Cheers. 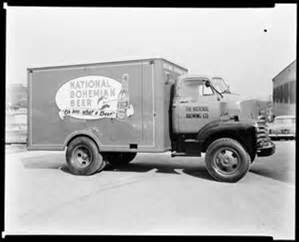 This photo from the Baltimore Sun archives shows a National Bohemian delivery truck... definitely something that looks like it can be fabricated from one of my many Mini-Metals HO scale vehicles. "Once it was Crayolas... Now, it's all PanPastels." I guess one of the beauties of having an adult hobby is the opportunity for loved ones to supplement the obligatory holiday gifts of socks, ties and underwear with something that still makes us feel like a kid on Christmas morning. But as I comprised a wish list for my wife and daughter, several ironies did dawn on me. PanPastels topped my list so that I could begin to weather the roster I have been compiling, but it made me question just how far I had really come in 50+ years. Back then, Crayola Crayons were the ticket for all things coloring... book reports, posters, banners, etc. Had I simply exchanged one iconic product for a future one? No matter, at least now I knew that it was actually advisable to wander outside of the lines... and that Raw Umber and Burnt Sienna now had a rather important place in the color palate very near the head of a mature class. Santa delivered the two primary sets of muted colors... the very same colors that were often left with hardly-worn near-perfect points in the old Crayola box. The wide choice of sponges should assure that I will deliberate far too long over which is best for any given application. Tony Koester presented an article in the November 2013 Model Railroader on quick and competent weathering for large rosters specifically using this product. The author, editor and lifetime veteran of our hobby essentially advised that anyone could do this... which is probably easy for an author, editor and lifetime veteran of the hobby to say! But as far as I know, no one has ever confused with me Tony. Hmmm, should I remain skeptical? But 'rock star' and former blogger Ralph Heiss of the Lehigh Valley Harbor Terminal Railway presented a clinic on this very topic to the Garden State Division almost two years ago. The theme? "If I can do it, then anyone can." OK Ralphie boy. Then I'm in. I look forward to experimenting on some really old, toy-like Tyco boxcars and the like. But I would love to hear from any other blogger who may have posted about this, or any reader who may be able to provide a link or interesting tidbits about their own experience using PanPastels. Please add your own two cents in the comments section below. Thanks and happy coloring! 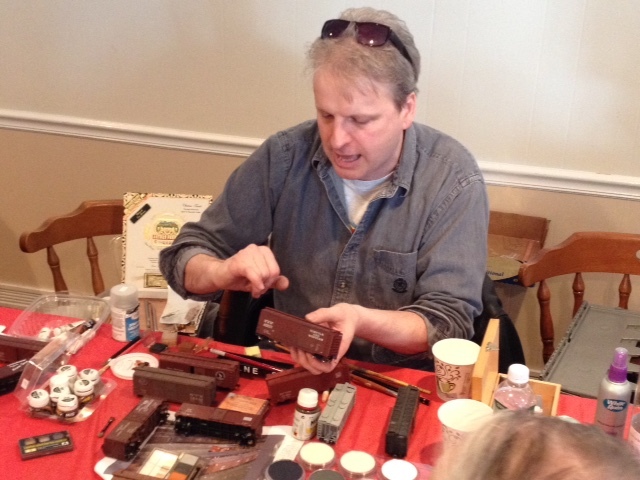 Click for WEATHERING TUTORIAL from Ralph Renzetti of Railroad Lines Forum. 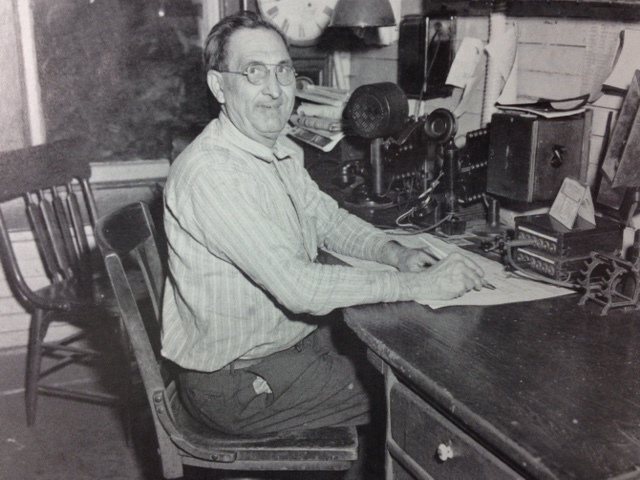 Click for WEATHERING POST and other links from Chris Ellis of the Adena Railroad blog. As kids, we all knew that getting the Crayola 64 pack was like hitting the mother lode. Hallmark has cleverly marketed Christmas tree ornaments that tap into such nostalgia. My wife just had to have it! "Sykesville, railfanning... and New Year's Eve?" An invite from dear friends in Maryland to a New Year's eve dinner party was a no-brainer once our daughter confirmed that she would indeed be jetting off to Italy to spend the holiday with friends made during her study abroad. So the pups were off to meet new playmates at a local boarding facility, Miss La-di-da went to Milan and we stole 40 hours of R & R sandwiched between eight hours of I-95. 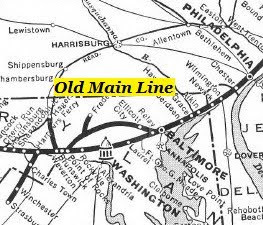 We arrived Wednesday evening and I immediately plotted out a research expedition to the western part of the Old Main Line that I would be modeling, namely the Sykesville area, about 35 minutes northwest. I figured that I could get away the next morning while the others did whatever they chose to do. 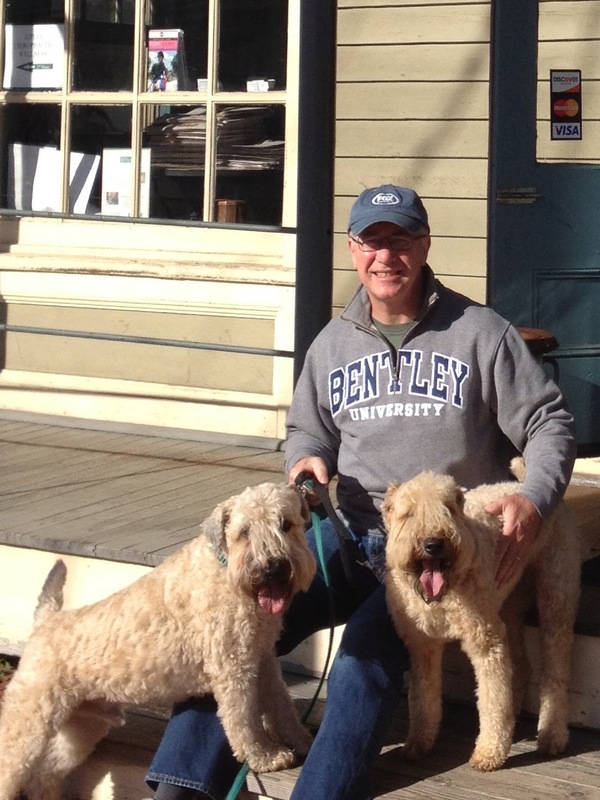 But to my surprise, my wife and our hosts wanted to share in my excellent adventure. "What exactly is this model railroading thing of which you speak," they queried. 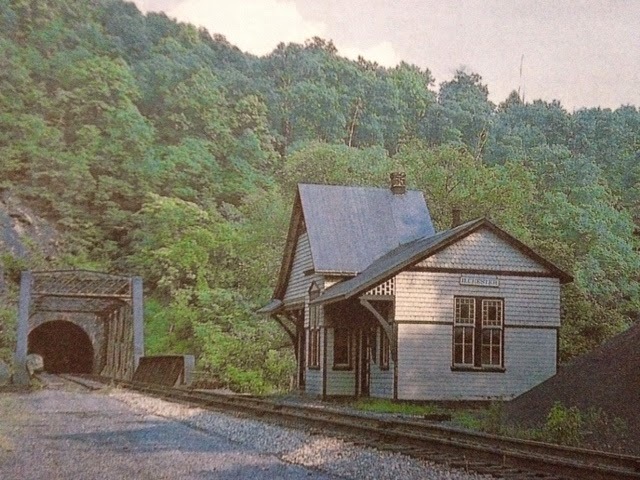 As we approached the gateway to Sykesville at the Patapsco River bridge about 1 pm, the unmistakable sound of a rumbling train combined with the crossing's alarm bells advised us that our timing was one Chevy Blazer away from being absolutely impeccable. The sheer size, sound and power of the empty westbound coal train was stunning when witnessed from such close proximity and in such an unexpected fashion. 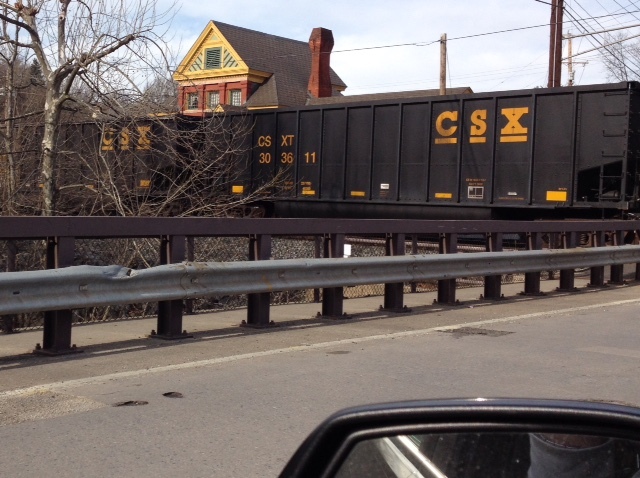 The train barreled through for about four minutes, obscuring all but the central section of the Sykesville depot. My primary goal on this trip was to get a better idea of various land forms and the relative relationships between the mainline, river and overall geography. Here is a view from the bridge looking west just in front of the depot that was undermined during the flood in 1972. 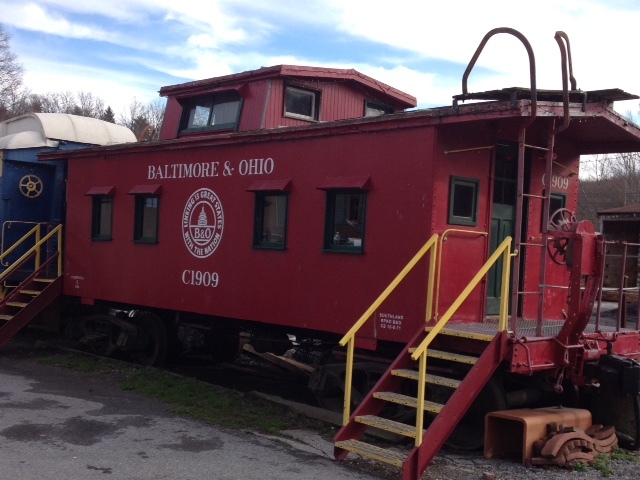 There is a bit of an ad hoc collection of railroad memorabilia adjacent to the station including a former Pennsylvania Railroad signal tower, a C&O passenger car and this refurbished B&O caboose. It was unfortunately closed during our visit. There was also this not-yet-refurbished-and-we-don't-know-if-it-ever-will-be caboose sitting on a former siding just west of the depot building. I assume that it was also closed. We climbed to an area west of town tracing an abandoned spur to the nearby State Hospital. The sharp difference in elevation throughout Sykesville surprised me. Here the old tracks are visible in the foreground with the mainline below and the river just beyond. The grade at which the spur climbed was very substantial. It was essentially only used by a 'dinky' pulling a single coal hopper every few days to provide for the hospital's power plant. 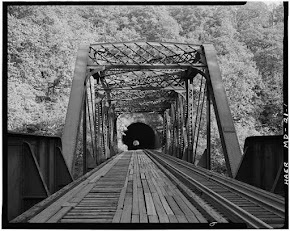 We moved east to once again gauge the relationship between the river and the mainline and to get plenty of photographs that would help me depict a time of year in which little is in bloom. 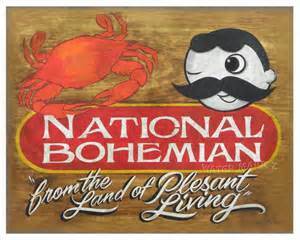 While I'll be portraying March, my Maryland friends assure me that this is probably pretty representative of that time anyway. Part of modeling the OML in 1960 is to depict that which was no longer utilized by that time like this bridge abutment which is the only remains of the Henryton Road bridge over the Patapsco, just east of Sykesville. I was assured throughout the day that my railfan mates were sincerely enjoying themselves and not just humoring me, even when I would channel my inner Cliff Clavin and recite interesting historical anecdotes and relatively useless facts and figures. So, all in all, it was a banner day. Several dozen photographs for later reference for me and a few minor purchases from quaint shops for the ladies. We were home in time for final dinner prep, a great meal and a few drinks, plus some lousy bowl games and some even lousier New Year's Eve shows. We are all now well assured that we are no longer a preferred demographic target for any television network. Happy New Year everyone! Big thanks to my backseat hosts, Jim and Carrie for this video and fine hospitality.